Many have been left disheartened and disgruntled by the recent scandals and political issues that have plagued the nation. Many react with both dismay and distress towards the present and future of Malaysia. While negativity may be the norm, a crew led by Danny Lee are expressing themselves through a different medium—and I should add that it’s a positive one—they are expressing themselves through dance. Armed with a Go Pro 4, Rejuvenate Dance Crew took to the streets of Malaysia in dance and they recently put out a video of their adventure on YouTube. 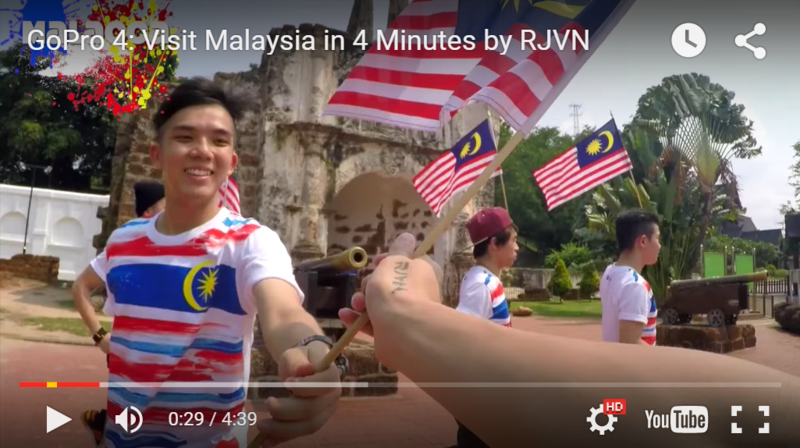 Entitled as “GoPro 4: Visit Malaysia in 4 Minutes by RJVN”, the video does just that. The video begins with flashing images of them walking towards different places and they start off their journey at Negeri Sembilan. Sporting T-shirts with Malaysian imagery, a crew of 4 dance their way through Malacca all the way through key Malaysian sights and they eventually have a dance off at the Twin Towers. It’s very clear from their efforts that Rejuvenate Dance Crew have their priorities right. They have love for their nation and they’d rather express themselves through positive mediums than negative ones. “The results of 3 months in the making… Rejuvenate Dance Crew travelled around Malaysia meeting lots of people, going to lots of places,” the team said on their Facebook page. The catchy music used in the video is actually “Malaysia Kau KuCinta” by Adibah Noor. This isn’t their first rendition of a Malaysian-themed dance video. They also put out a video titled, “Malaysia Has Hope – A Dance Representation”. The video (a personal favourite of mine) starts of pretty shady and dark with a bunch of dancers (I assume they were spirits or demonic priests, maybe) clothed in black robes encircling a guy in white (I’m going to assume that he represents the good). The video has incredible imagery, cool music and dope choreography and they battle things out (not entirely) and as the video progresses they eventually swap their robes with T-shirts printed with a picture of Malaysian flag, and the “good” comes out on top. It’s always a breath of fresh air to see people taking things in their stride and expressing themselves in a positive manner, especially through dance.